Seventeen years after her body was discovered in the basement of her parents’ home, a Colorado judge ruled that grand jury documents in the JonBenet Ramsey murder investigation would be released to the public. The ruling came in response to a lawsuit filed by the Reporters Committee and Daily Camera reporter Charlie Brennan. 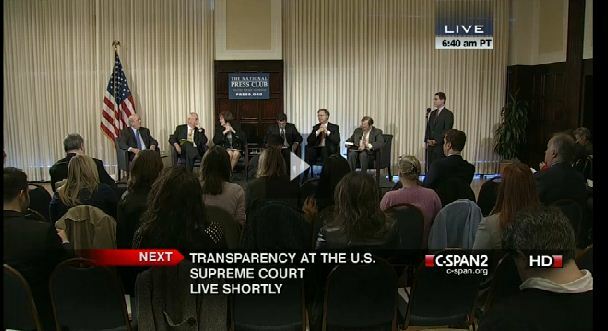 A Reporters Committee-hosted panel discussion on Oct. 25, 2013 at the National Press Club in Washington featured a stellar panel of experts discussing Supreme Court transparency issues, such as cameras in the courtroom, recusals and press pools. The event was broadcast live on C-SPAN 2 and is now available on the C-SPAN website. But as legislators draft laws [restricting release of the photos], they are finding plenty of resistance, much of it from journalists who assert that public records should be just that: public. The Reporters Committee for Freedom of the Press argues that any restriction on booking photographs raises First Amendment issues and impinges on editors’ right to determine what is newsworthy. That right was recently exercised by newspapers and Web sites around the world when the public got its first look at Aaron Alexis, the Navy Yard gunman, through a booking photograph from a 2010 arrest. “We are pleased to see that the Judiciary Committee passed this bill. It goes a long way toward ensuring that reporters will be protected from subpoenas for their confidential information and sources. It’s not a perfect bill, but it tried to cover a broad array of reporters. While it is not as inclusive as we would like, it is not nearly as limited in that area as previous attempts at federal shield law have been. It still is important that we work with Congress and the administration to make sure journalists’ records are not scooped up in broad surveillance programs, and that Justice Department attorneys respect the rights of reporters, but today’s action is a significant step in the right direction. We are pleased to see that the Judiciary Committee passed this bill. It goes a long way toward ensuring that reporters will be protected from subpoenas for their confidential information and sources. It’s not a perfect bill, but it tries to cover a broad array of reporters. While it is not as inclusive as we would like, it is not nearly as limited in that area as previous attempts at a federal shield law have been. The Reporters Committee for Freedom of the Press has been at the forefront of the condemnation and call-to-action following the news that the Department of Justice secretly subpoenaed the phone logs of Associated Press journalists in the government hunt for a leaker. Within 24 hours, the Reporters Committee wrote and coordinated a letter co-signed by 50 news organizations calling on the government to explain its overreach and calling for renewed efforts for a federal shield law. The Reporters Committee also responded with a statement as the news soon followed that a Fox News reporter was investigated by the Justice Department as a “co-conspirator” for his newsgathering that involved classified information from a confidential source. Reporters Committee senior legal staff have since fielded dozens of media calls, helping to explain the legal intricacies and next steps needed to protect journalists’ confidential sources, and the media coalition letter from the Reporters Committee has been featured in numerous media accounts. The Reporters Committee also has been called on for discussion of the NSA leaks by a government contractor. Reporters Committee Legal Defense Director Gregg Leslie appeared on the Today Show May 14, 2013 to discuss the Justice Department’s intrusion into the phone records of AP journalists. Watch the clip online. Reporters Committee Executive Director Bruce Brown is interviewed March 4, 2013 by Furman University President Rod Smolla for the segment, “Pivitol Elements: Journalism, Education and the ‘New Media’ ” on the university’s YouTube channel. Watch the interview here. Reuters turned to the Reporters Committee to comment on a New York state appeals court ruling against a N.Y.-based Fox News reporter’s effort to nullify a Colo. court’s subpoena seeking the confidential sources for her sources in a story about accused movie-theater shooter James Holmes. The Reporters Committee filed a brief in the case, which was signed by 40 news organizaitons including Reuters. “It’s hard to say New York is such a good law when it leaves a reporter no remedy when another state wants his materials,” said Gregg Leslie, the committee’s legal defense director. Legal Defense Director Gregg Leslie, commenting on the espionage conviction of Bradley (now Chelsea) Manning, told The New York Times that the results were alarming, particularly in light of how important the information was to the public debate. Usealing court documents in a case involving the mayor of Washington, D.C., was discussed by Reporters Committee Legal Defense Director Gregg Leslie during an interview May 3, 2013 on NewsChannel 8 program NewsTalk with Brian DePuyt. Watch the clip here.